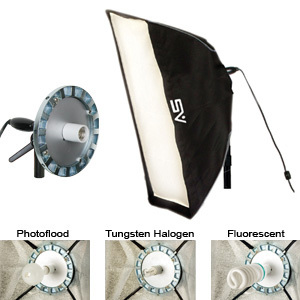 The Smith-Victor Economy SoftBox Light™ is a great way to take advantage of soft box lighting quality at very reasonable prices. The Economy SoftBox Light™ can be used with photoflood, fluorescents and screw-in tungsten halogen lamps. 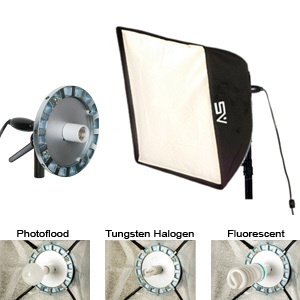 The silver metallic lining inside the soft box is designed for maximum brightness while the diffusion panel provides the smooth velvet light soft boxes are known for. The light fixture has a ceramic socket that will accept all standard Edison base lamps. The light stand adapter will fit 5/8” light stands. The mounting bracket features an insulated handle on the tilt mechanism and a ratchet locking system. 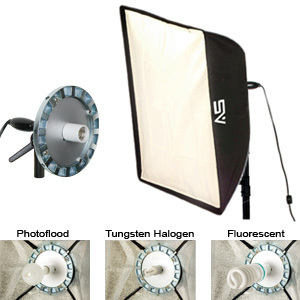 All-in-one Economy SoftBox Light combines the SBL-1 light with a soft box! Quad Socket allows the use of 4 fluorescent lamps in one socket. Maximum wattageis 300 watts.